Carports. They seem like a great idea, a portable garage which keeps your car protected from the elements while it sits in your driveway. 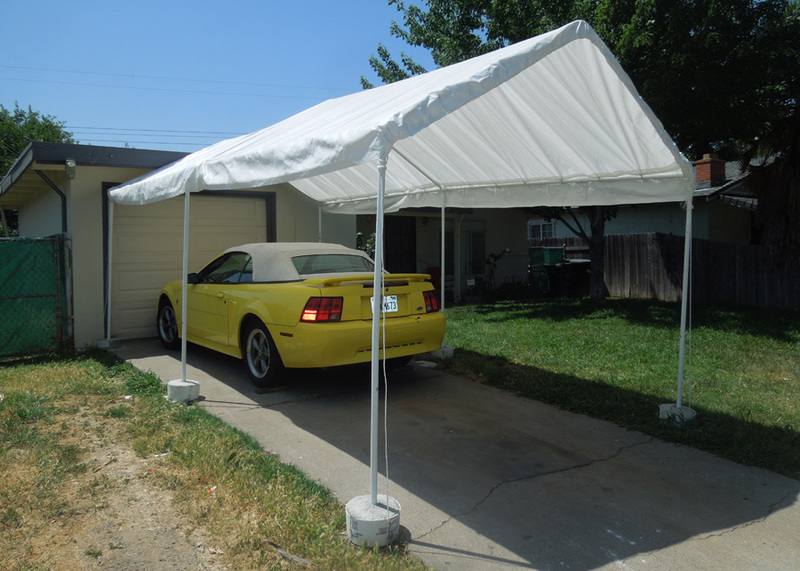 Unfortunately, there are a lot of ways for a carport to look really terrible. 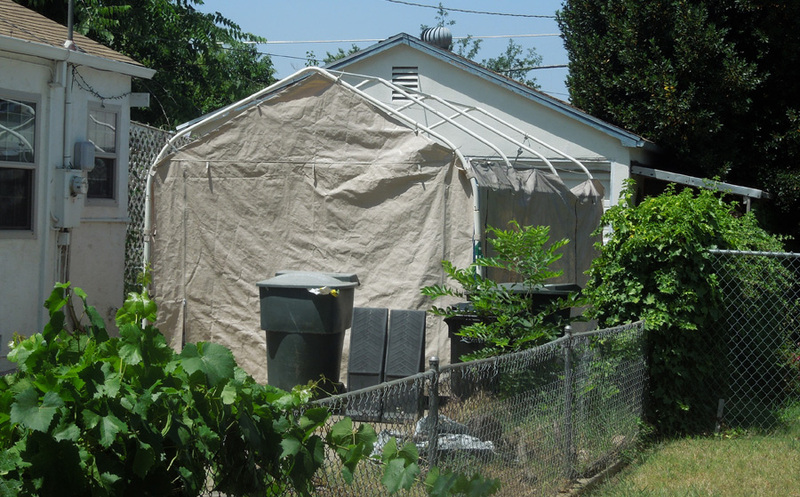 The carport above, a very narrow shelter, appears to be an igloo formed from many layers of tarp. One of the reasons it is not attractive is because there is no distinct roof / wall junction. The roof just bends down to the ground. Also, the tarps curl over the front edge of the frame. 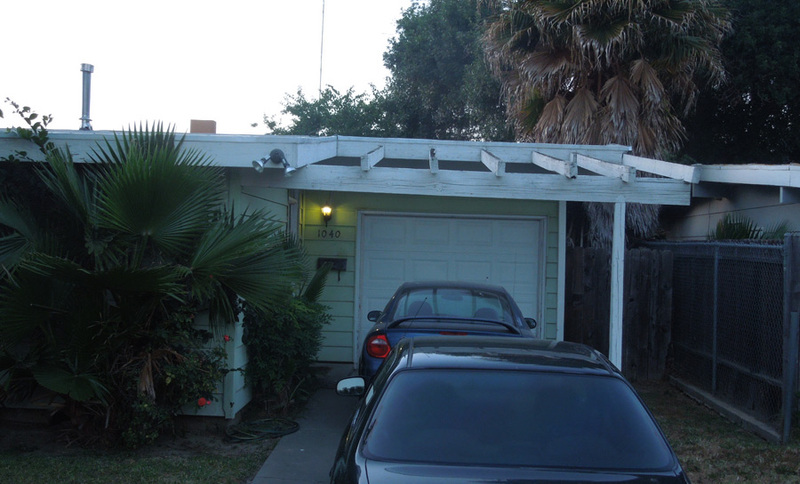 This carport is integrated into the roofline of this house. It is permanent and would probably be attractive if it was well painted. Of course, it would provide more shelter if it had more of a solid roof. 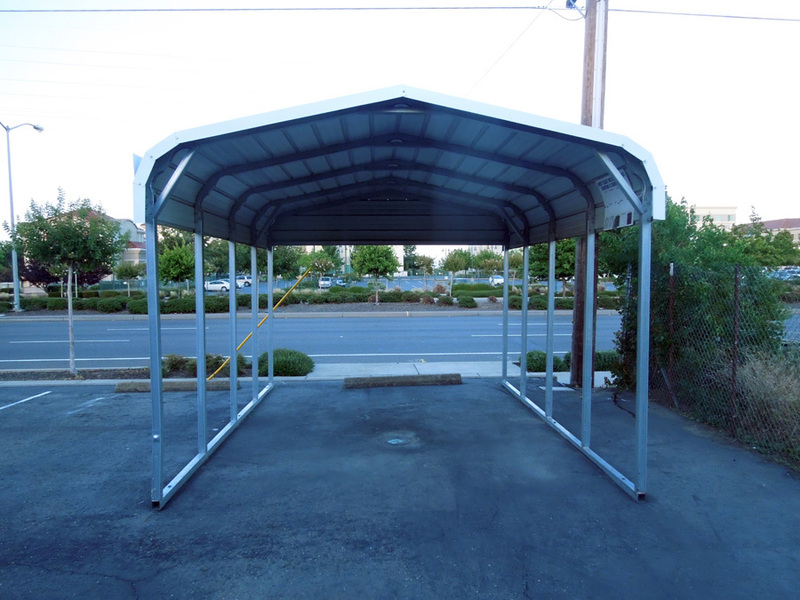 Most commercially-available carports are made of metal. This single car version above is 12 feet wide and 21 feet long. It sells for $795. 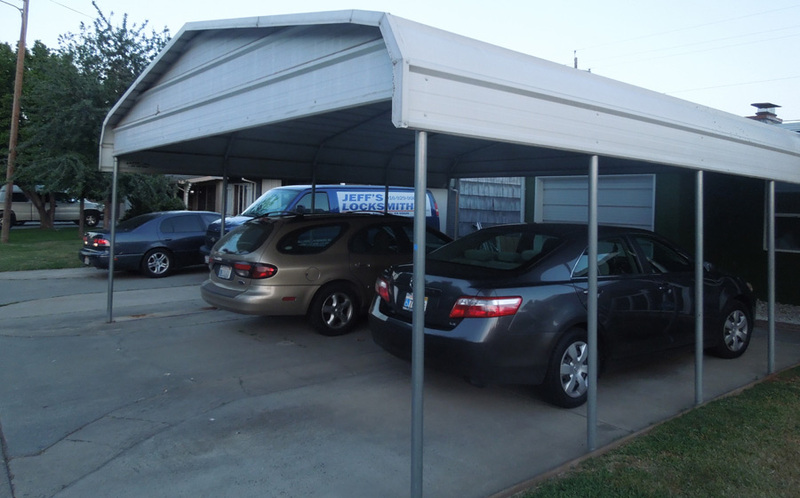 One of the design challenges of a carport is how to make the legs steady and sturdy. The legs have to support the roof, which may not be heavy, but will be subject to a lot of force from the wind. Note that the legs are attached to a rail which runs along the ground. 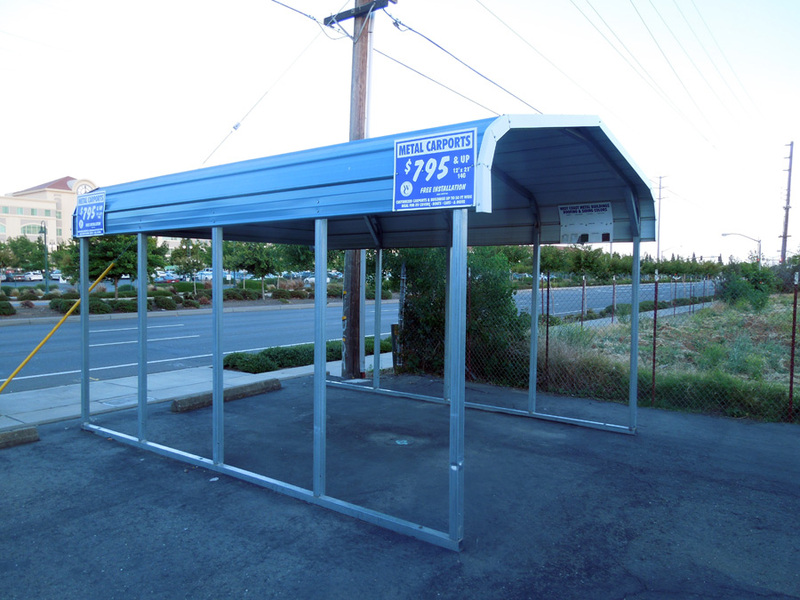 Here is a wide metal carport set at the back of someone's wide driveway. 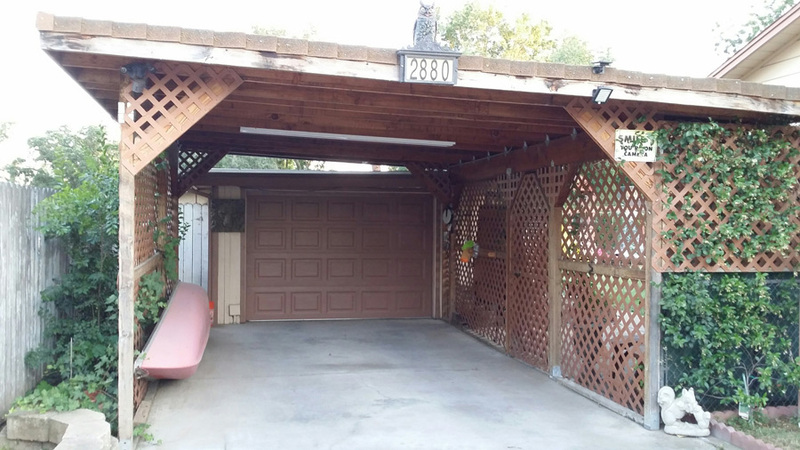 This carport looks very sturdy and attractive, almost like it was designed for this space. 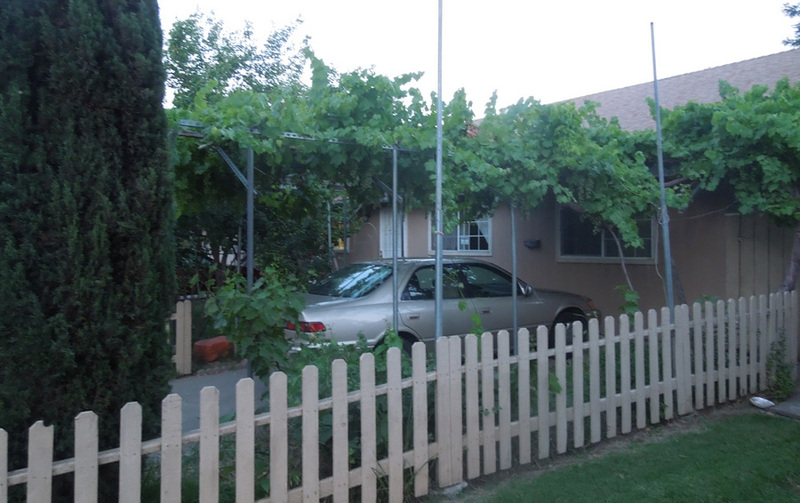 Here is an older two-car carport. This one has rounded pipe legs which were sunk into the driveway concrete. It also has a panel running across the top front. This was eliminated in more recent designs. Maybe an enclosed roof space tends to hold in the heat. 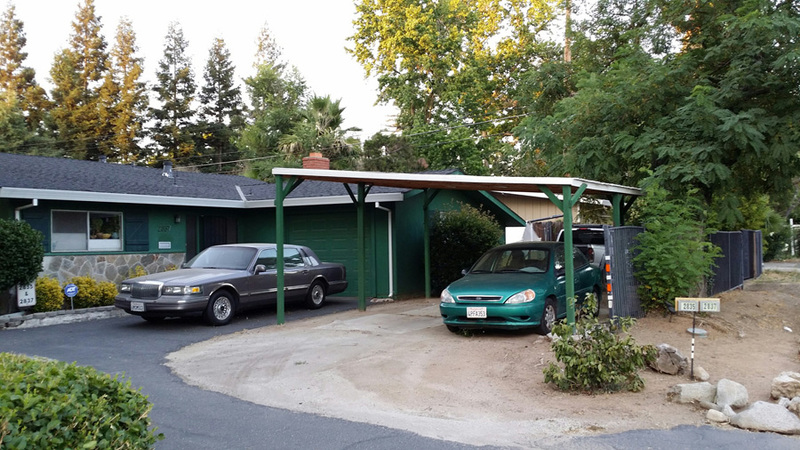 Here is a homemade double-wide, double long four car carport. It was made with lightwight steel poles (conduit). 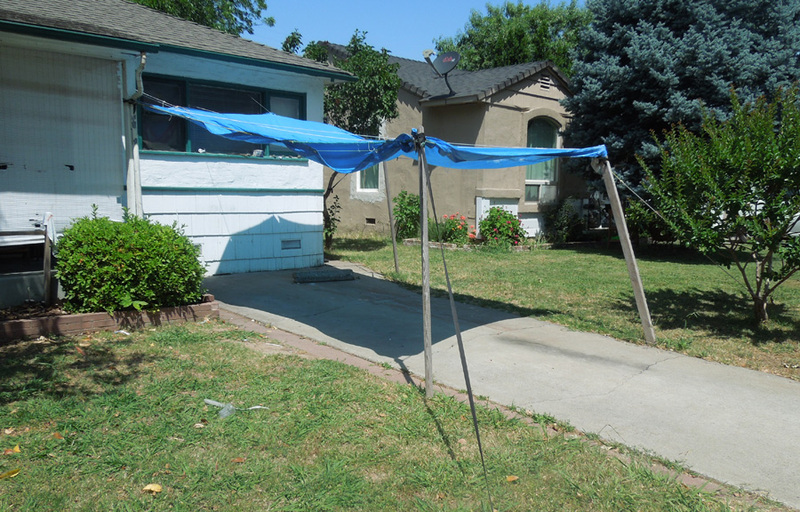 The homeowner had welded his own metal brackets to hold the poles and stretched a tarp across the roof. He didn't actually park four cars under this, he had a truck with a trailer. After looking at a lot of carports, I realized that I was averse to the ones which were set up close to the sidewalk. Carports which were set further back on the property tended to be more attractive. 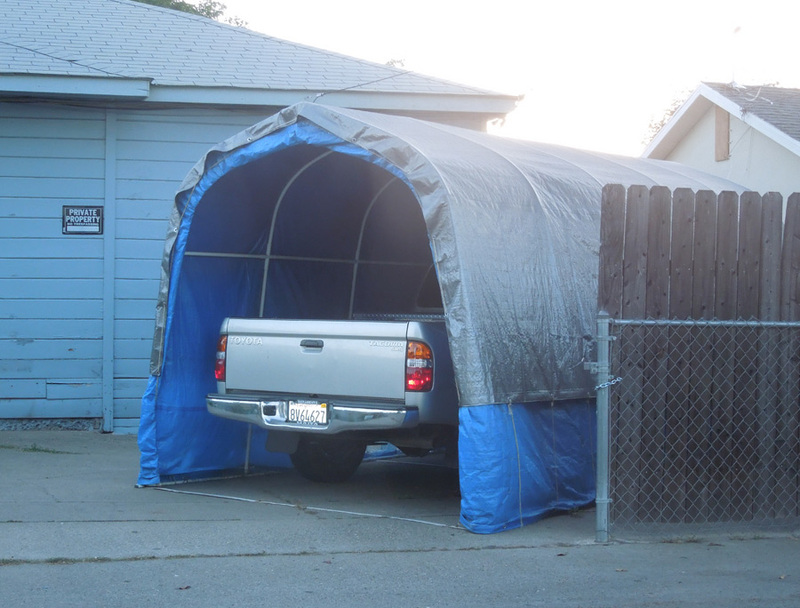 From an engineering point of view, this is a good, cheap carport, but I wouldn't want to live next door to him, especially with that brown plastic film wall on the right. Here's a nicer two-car carport. It looks sturdy, as it is made of wood, painted to match the home and uses quality roofing material. I believe the legs are cemented in place. This sideways configuration allows all three cars to come and go independently (no one can get boxed in). Unfortunately it converts the lawn into dirt parking spaces. 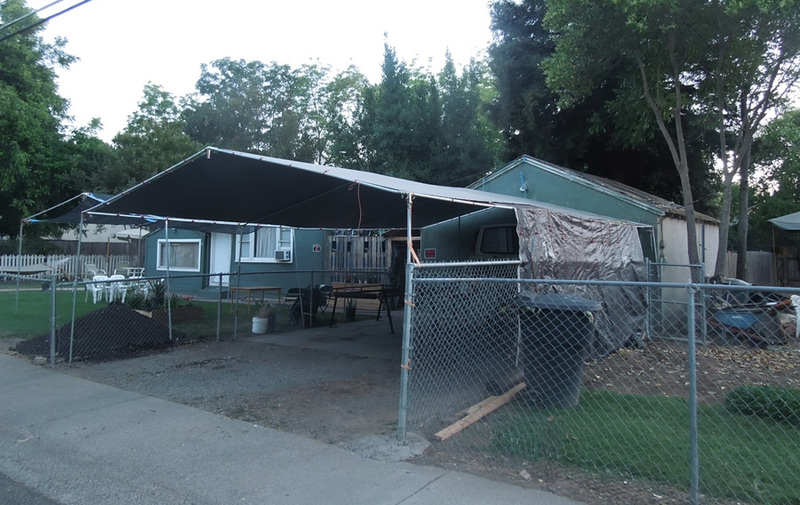 Here's a double-wide tarp-covered carport set up close to the house. It is not attractive, but at least it isn't set up at the property line. When the tarp isn't stretched tightly, it looks ugly. 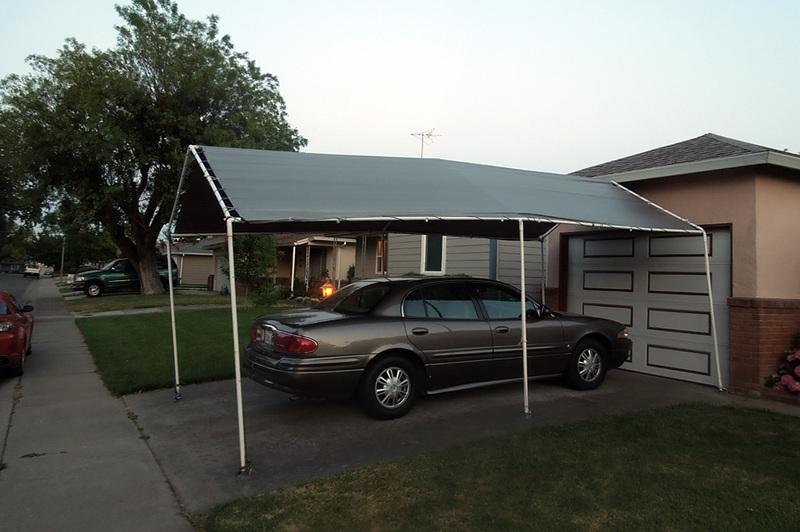 The simplest carport is a cheap "easy-up" 10'x10' popup shelter. These are about $75 on ebay. They look like they are about $75 on ebay. This guy was using it as temporary shelter while he worked on the wheels. This carport had a privacy flap. Actually, the roof was missing too, so maybe this was a secret greenhouse or the roof tarp had been destroyed by weather. 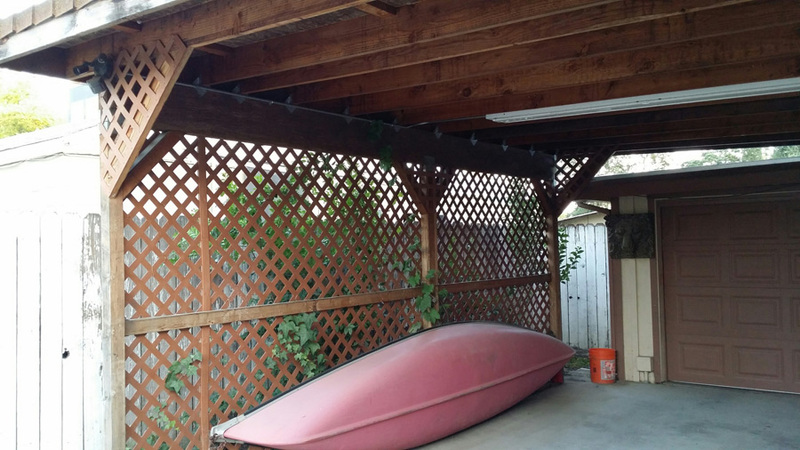 This carport is fashioned from three 2x4 posts and some expertly-knotted straps. Of its many fine features, my favorite is that its upper edge is halfway up that bedroom window. Just as a reminder, this is a car cover. These are about $55 on ebay, assuming this is a 2013 Dodge Charger. 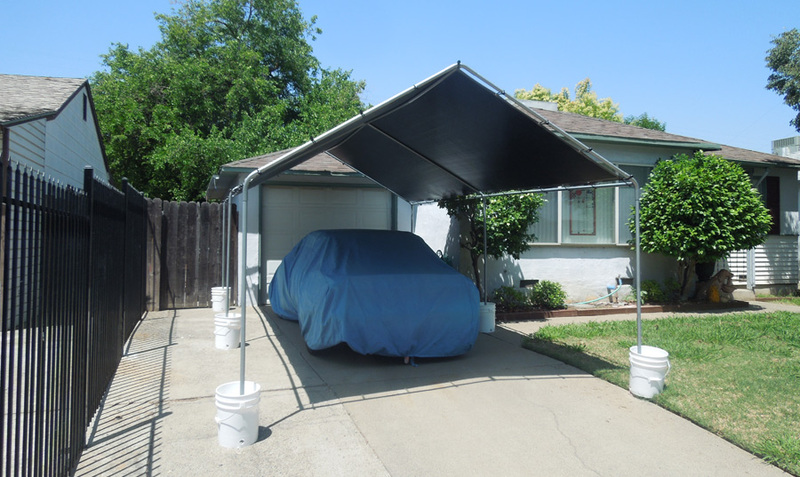 A car cover is an excellent alternative to a car port. 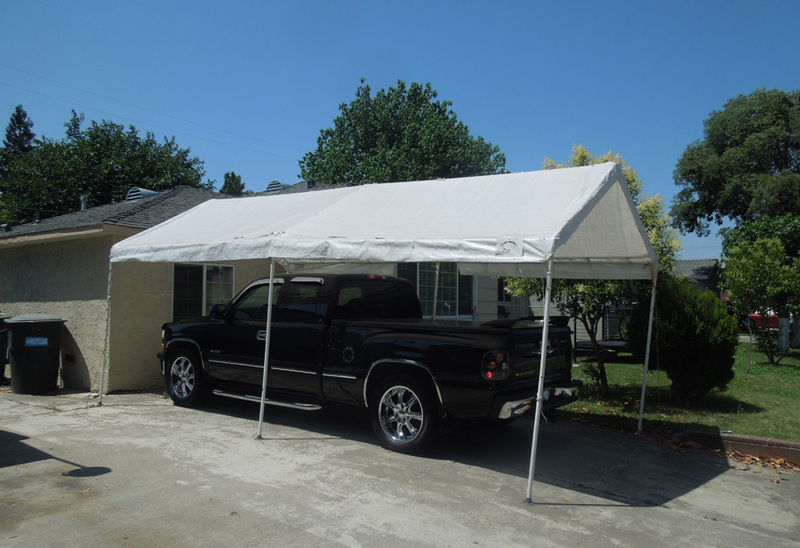 They are not as convenient, but they are usually more attractive than a car port, and they are portable. The overhanging tree provides shade, but might also be a source of fruit stains and bird droppings. 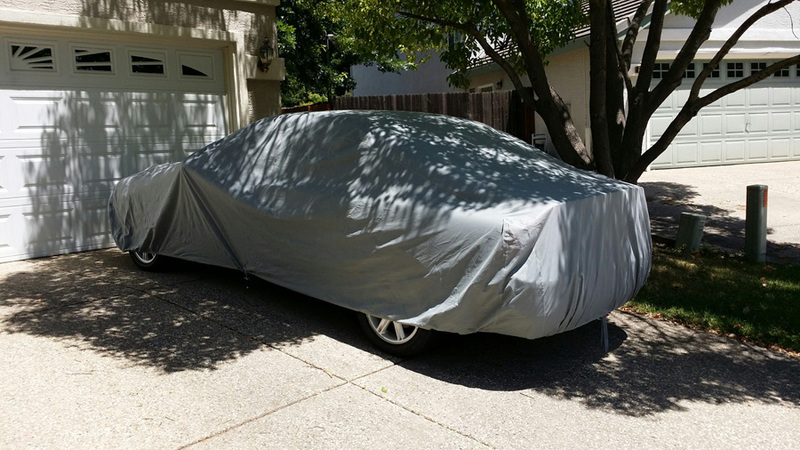 Here's a car with both a car cover and a car port. 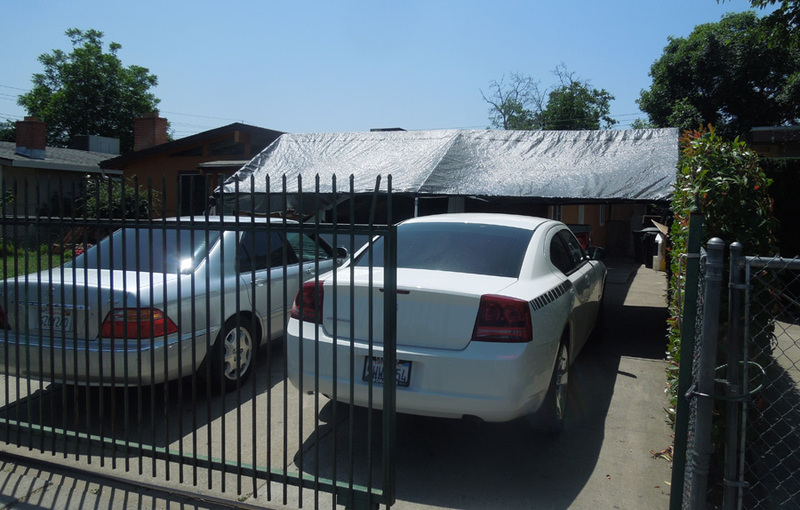 This carport utilizes a heavy, purpose-made tarp roof, which is stretched tightly and does not overhang it's frame. Unfortunately, the legs of the carport have been anchored with six white buckets, filled with rocks. How could this be improved? I'd fill each of the buckets with an abundant bouquet of artificial flowers. Then I'd set the whole thing on fire. Note the drain holes on the buckets. 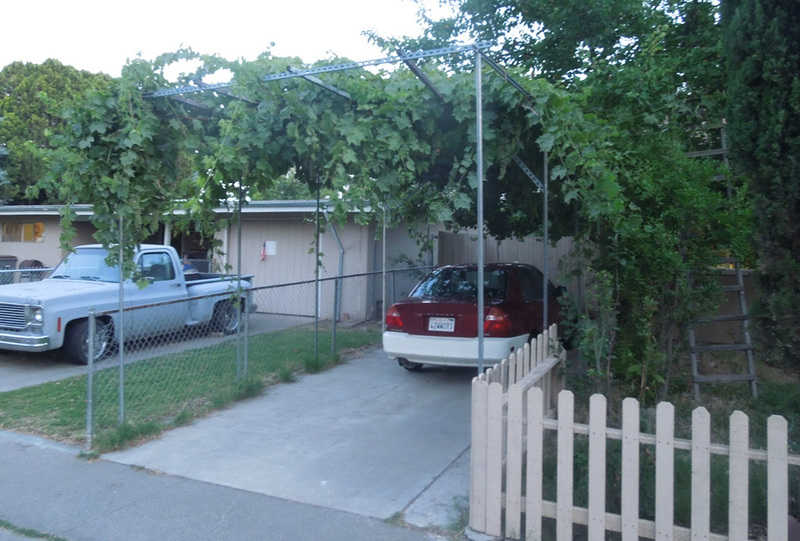 Here's a side view of a similar carport. This one uses pipe flanges at the feet, and may be bolted to the cement. Note that the carport has a kink in the center to allow for the irregular slope of the driveway. 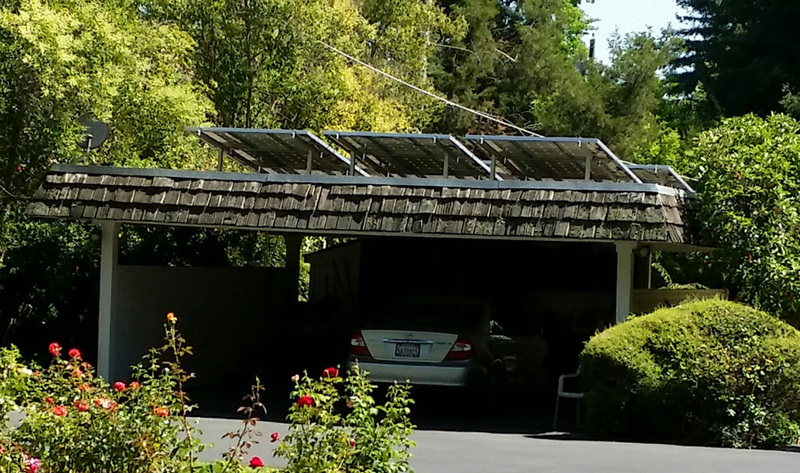 I didn't see any steel-framed carports on sloped driveways. I bet the rails at the bottom of the legs would high-center on that driveway bump. 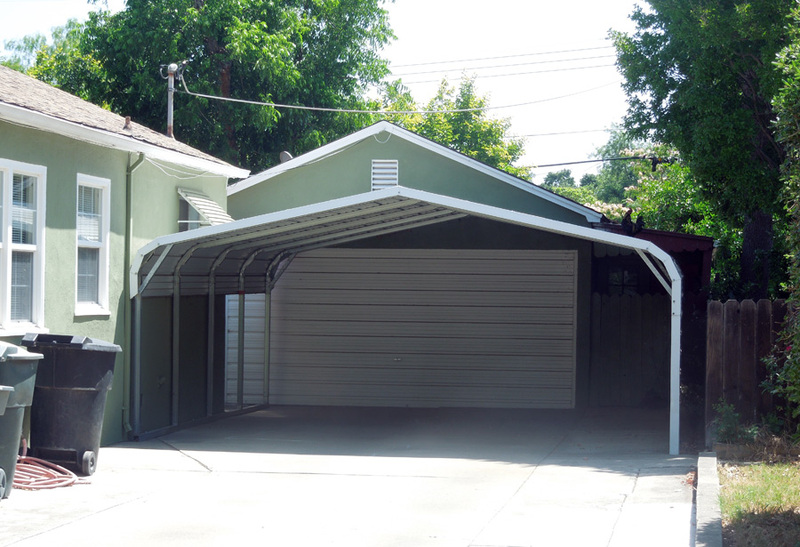 Here's a carport which is attractive, built solidly and with materials which match the house construction. It is far from the sidewalk and only uses two legs. Obviously the truck doesn't quite fit under it, but there is a little electric kid car back there, fully shaded. 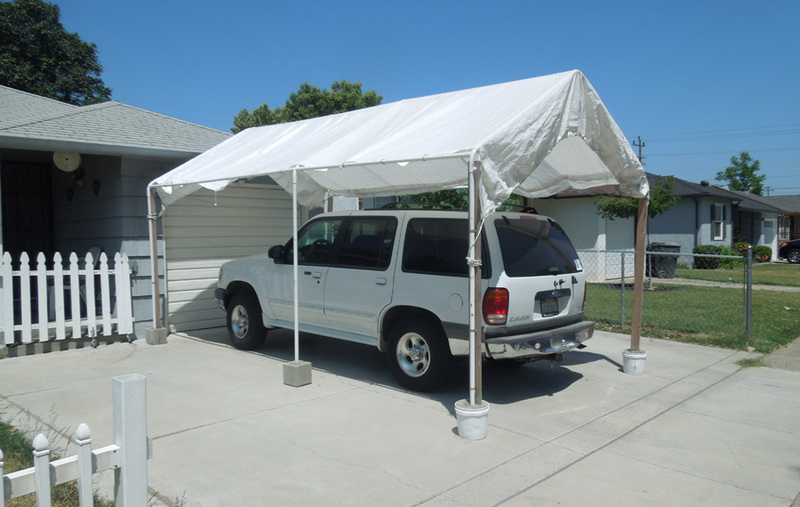 Here's a carport with a sloppy white tarp cover using six cement-filled half-bucket feet to hold the legs in place. I bet if you cut the white plastic bucket away, these feet wouldn't look too terrible. How to make a cement patio umbrella holder. Here's another one. The tarp looks terrible. Some of the legs are secured with cement blocks while others have cement-filled buckets. Four of the posts are wood 4x4s, with steel pole legs lashed to them. Here's another one which looks much better simply because the tarp is pulled tight and the feet are small flanges. 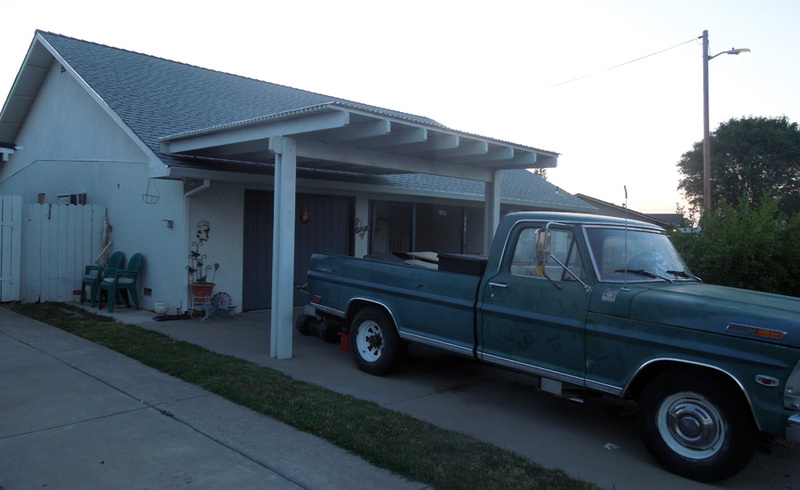 This substantial carport is one of my favorites. It's got a real roof plus eleven ceiling joists which each look like 2x6s, standing on seven 4x4 legs. It has attractive 45° supports and its walls are (plastic) lattice sheets. It looks inviting, and it is set back on the property, away from the sidewalk. 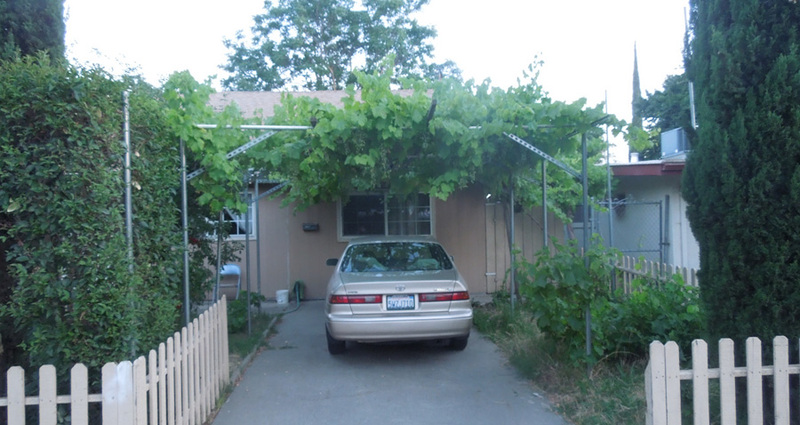 Here's an idea which just missed being the ultimate carport: grapevine trellis. These grapes are thriving in springtime, providing a ton of shade. Unfortunately the structure beneath the vines looks like an erector set of steel pipes and supports. I should also warn that grapevines can look downright evil in the wintertime. 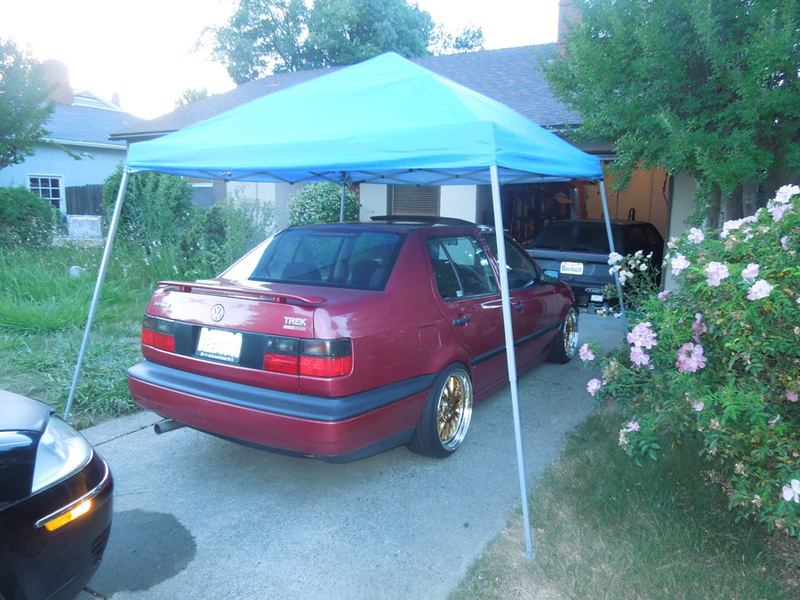 Finally, here is a photo of pretty much the best carport ever. It has massive 6x6 posts, solid sidewalls and a full flat roof with an array of solar panels. Building a carport? I recommend one like this, surrounded by a lush garden and set back from the street on a half-acre lot.